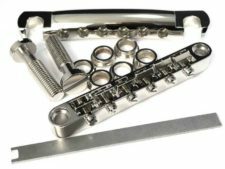 All Pro Sustainer System™ parts can now be ordered in one convenient “Master Kit,” at a 5% discount over buying the parts separately. 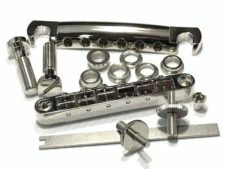 The “Tone-Lock”™ MASTER KIT includes “Tone-Lock”™ studs and spacers, a TP-59 tailpiece and a “Tone-Lock”™ Bridge. 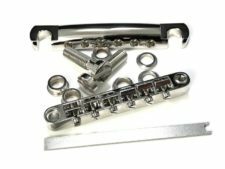 Choose the “Gibson & Other USA Made Guitars” category to completely upgrade your ABR-1 equipped guitar (i.e., Gibson Historics and any guitars using ABR-1 style 6-32 threaded bridge posts), or a Nashville bridge equipped guitar (requires optional Faber® bridge studs – pre made kits available!). Choose the “Epiphone & Other Imported Guitars” category for guitars with 4mm bridges posts (i.e., non-USA made guitars, such as Tokai), or, using the optional Faber® E-Sert or ESWKIT™, for many Epiphone guitars and other non-USA made guitars using a Large Bridge Post system. See product descriptions for further details.